In the classical metabolic oxidation scheme, hydrophobic endogenous or xenobiotic compounds undergo phase I oxidation, generally catalyzed in the liver by cytochromes P450, followed by phase II conjugation reactions, in a way that allows much more polar metabolites to be expelled from the cell through active transport mechanisms. Cytochrome P450-mediated oxidation of steroid sulfate has been described, suggesting that oxidation of polar metabolites such as glucuronide derivatives of endogenous compounds can occur. As an example, we report here that hydroxyestradiol-17β-glucuronide can be directly formed through oxidation of estradiol-17β-glucuronide on the aromatic C2 position. This reaction is specifically catalyzed by CYP 2C8, which is more active in female than in male human liver microsomes. A thorough docking of the molecule within the CYP 2C8 crystal structure shows that the active site is large enough to handle a glucuronide conjugate. Moreover, the most energetically favored position of the bound ligand is fully consistent with the recently published structural determinants of substrate specificity of the CYP 2C8 active site. This is the first demonstration of cytochrome P450-mediated oxidation of a steroid glucuro-conjugate. Such oxidation of a glucuronide should be a general process since, in addition to estradiol and testosterone glucuronide, it has been observed for xenobiotic compounds, e.g., diclofenac or naproxen glucuronide. Cytochrome P450 enzymes (P450s) have long been of interest because of their role in the metabolism of xenobiotic or endogenous compounds (Guengerich, 1995; Lewis, 2001). Steroid metabolism has been extensively studied in the context of the formation of metabolites with hormonal activities or those involved in cancer proliferation. Steroids are primarily metabolized in gonads, and hepatic metabolism is also observed for many of them, leading to regio- or stereoselective oxidations (Aoyama et al., 1990; Lee et al., 2003). In this regard, hepatic metabolism of steroids is still an interesting tool to investigate the specific involvement of a given P450. It is generally admitted that P450-mediated reaction, also called phase I metabolism, converts hydrophobic compounds into more polar metabolites, some of them having toxicological effects. Phase II metabolism involves an adduct formation via a conjugation reaction, leading to a decrease of hydrophobicity or to a charge modification of the given metabolite. Several conjugation pathways are known, such as methylation, sulfation, and glucuronidation (Raftogianis et al., 2000). Metabolites are generally recovered in urine or feces after active transport out of the cells via ATP-binding cassette transporters (Goh et al., 2002; Zelcer et al., 2003). In addition to these classical metabolic pathways, it has been demonstrated that the sulfate derivatives of different classes of steroids, such as testosterone and estrogens, can be oxidized by cytochromes P450. Oxidation usually takes place at the opposite moiety as compared with the sulfate group position (Ingelman-Sundberg et al., 1975; Milewich et al., 1986). The main P450 form involved in dehydroepiandrosterone (DHEA) sulfate oxidation has been identified as CYP 3A7, an isoform present in human liver fetus (Kitada et al., 1987; Ohmori et al., 1998). Oxidation of 5α-androstane-3α,17β-diol-3,17-disulfate has been observed in rat microsomes and attributed to the female isoform P450i (Ryan et al., 1984). This isoform is classified as CYP 2C11 in rat (Guengerich, 1995), and its sequence is very similar to that of human P450 2C (http://p450.abc.hu). In the present study, we demonstrate the formation of 2-hydroxy-estradiol-17β-glucuronide by direct CYP 2C8 oxidation of estradiol-17β-glucuronide. This metabolic pathway is observed in human liver microsomal preparations as well as in heterologously expressed cytochrome P450 isoforms. Chemicals. Estradiol, 2-hydroxy-, 4-hydroxy-, and 6α-hydroxy-estradiol, estriol, estradiol-3-glucuronide, estradiol-17β-glucuronide, estriol-17β-glucuronide, NADPH, NADP, glucose 6-phosphate (G6P), glucose-6-phosphate dehydrogenase (G6PDH), Helix pomatia or Escherichia coli glucuronidases, dexamethasone (DEX), sodium phenobarbitone salt (PB), furafylline, ketoconazole, quinidine, sulfaphenazole, bromocriptine, and paclitaxel were obtained from Sigma-Aldrich (Saint Quentin Fallavier, France). 6β-Hydroxyl-estradiol was obtained from Steraloids (Newport, RI), and tritiated estradiol-17β-glucuronide [estradiol-6,7-3H (N)] was obtained from PerkinElmer Life and Analytical Sciences (Paris, France). All other chemicals used were of the highest quality commercially available. Preparation of Microsomes. Male rats were housed and treated according to French legislation, in a facility authorized by the Ministry of Agriculture. Male Sprague-Dawley rats (200–220 g) (Iffa Credo, l'Arbresle, France) were treated with either PB (80 mg/kg i.p. in saline for 3 days) or DEX (100 mg/kg i.p. in corn oil for 3 days). Control rats [untreated (UT)] received only corn oil (0.5 ml/day for 3 days). Rats were sacrificed 1 day after the last treatment. Microsomes were prepared from a pool of four to six livers as previously described (Kremers et al., 1981), frozen in liquid nitrogen, and stored at –80°C until use. Human liver samples were kindly supplied by the Franche Comté Hospital surgery department of Université de Besançon, France and prepared as previously described (Kremers et al., 1981). Monkey, mouse, and dog male or female human liver microsomes were obtained from XenoTech LLC, Tebu-Bio (Le Perray en Yvelines, France). Yeast-expressed human P450s were prepared as already described and produced by SPI-BIO (Massy, France) (Peyronneau et al., 1992). The mutated CYP 2C8 isoform R241A expressed in yeast was kindly provided by A. Melet (Unité Mixte Recherche 8601, Centre National de la Recherche Scientifique, Paris, France). E. coli-expressed P450 forms were obtained from Cypex Ltd., Tebu-Bio. Bactosome-expressed human CYP 3A7 and UDPGT2B7 were obtained from BD Gentest (Le Pont de Claix, France). Protein content in microsomal suspensions was determined by the method of Lowry et al. (1951) using bovine serum albumin as standard. P450 concentration was measured as described by Omura and Sato (1964). Human specific isoform activities in human liver microsomes were determined by XenoTech LLC, Tebu-Bio. Metabolism. Metabolism of estradiol derivatives was studied at 37°C in 0.1 M potassium phosphate buffer (pH 7.4) with 1 μM P450 from rat liver or human liver microsomes, using 50 or 100 μM substrate and an NADPH-generating system (1 mM NADP+, 10 mM G6P, and 1 IU G6PDH) for a 0.5-ml incubation. Radioactive incubations were performed using 50 μM estradiol-17β-glucuronide and 0.5 μCi [3H]estradiol-17β-glucuronide. The incubations were stopped at the indicated times by addition of the same volume of acetonitrile and a 10% volume of 1 M acetic acid. The mixture was centrifuged at 10,000 rpm for 5 min and then frozen until analysis, before which it was remixed. Incubations of E. coli or Bactosomes Containing Human P450. Metabolism of 50 μM estradiol or estradiol glucuronides was studied at 37°C in 200-μl final volume phosphate buffer (0.1 M, pH 7.4), using 0.5 μM P450, and in the presence of an NADPH-generating system (1 mM NADP+, 10 mM G6P, and 2 IU G6PDH). Incubations of Yeast-Expressed Human P450s. Incubations were done, as previously described, at 28°C (Peyronneau et al., 1992) using 0.5 μM P450, 50 μM substrate, and 0.05 M Tris buffer (pH 7.4). The highest turnover values were obtained during incubations performed at 28°C instead 37°C, using yeast microsomal preparations (D. Pompon, personal communication). Enzyme Inhibition Measurements. Inhibitors in DMSO were added to the incubations of microsomal suspensions containing 50 μM estradiol-17β-glucuronide and an NADPH-generating system diluted in 0.1 M phosphate buffer (pH 7.4). The final volume of organic solvent did not exceed 2% of the incubation volume. The incubations were stopped after 30 or 60 min by adding the same volume of acetonitrile and 10% 1 M acetic acid. The mixture was cooled and centrifuged at 10,000 rpm for 5 min. Enzymatic Estrogen Glucuronide Hydrolysis. Glucuronides were enzymatically hydrolyzed using either 5000 IU/ml H. pomatia glucuronidase at pH 5.2, 0.1 M acetate buffer, or 2000 IU/ml E. coli glucuronidase at pH 7. E. coli glucuronidase was shown to be the most efficient for hydrolysis of estrogen 17β-glucuronides. HPLC, HPLC-MS, and MS-MS Analysis. HPLC-UV and HPLC-radioactivity detection were performed in linear gradient mode on a reverse-phase column (Kromasil 5C18, 150 × 4.6 mm) at a flow rate of 1 ml/min: solvent A, 10% acetonitrile in aqueous 10 mM ammonium acetate; and solvent B, 90% acetonitrile in water (t = 0 min 100% A, t = 40 min 100% B). Estradiol glucuronides were quantified from a calibration curve plotted using liver microsomes and UV detection at 280 nm. Estradiol glucuronide metabolite formation was estimated by means of radioactivity counting upon use of tritiated estradiol glucuronide, with an online PerkinElmer Life and Analytical Sciences Flo-One radioactive detector and a liquid cell, and a 2 ml/min PerkinElmer Life and Analytical Sciences Ultra-Flo AP liquid scintillator. Otherwise, metabolites were quantified according to the 280-nm extinction coefficient of estradiol glucuronide using Waters Millennium software (Waters, Milford, MA). HPLC-MS and MS-MS analyses were performed on an LC-Duo Thermo Electron (Franklin, MA) ion trap with an electrospray ionization source operating in negative ionization mode, coupled with a Kromasil 5C18 150 × 2.1 mm column. The source was set with a spray voltage of 4.5 kV, a sheath gas flow of 70 ml/min, and an auxiliary gas flow of 10 ml/min. The capillary temperature was set at 220°C with a voltage of –35 V; offset multiplier 1 was set at 2.75 V and multiplier 2 at 6.0 V, and lens voltage was set at 32 V for analysis of glucuronide derivatives and at 14 V for unconjugated derivatives. The maximal trap ion quantity was set at 107 ions. Collision energy was 48% and 40% for conjugated and free derivatives, respectively. Direct injections were performed in 50:50 acetonitrile/water containing 10 mM ammonium acetate under the same MS conditions, either with an LC-Duo Thermo Electron ion trap or a Quantum Discovery Thermo Electron triple quadrupole, both operated with an electrospray source. Computational Procedure for Docking and Molecular Dynamics Simulations. Molecular dynamics simulations have been carried out on the CYP 2C8 crystal structure (1PQ2; Schoch et al., 2004) using the NAMD code (Kalé et al., 1999). CHARMM force field parameters (release c31b1; Brooks et al., 1983) have been used for all the simulations presented herein. The set of force field parameters of anionic estradiol-17β-glucuronide has been obtained by combination of those of cholesterol, glucose, phenol, and toluene. The CHELPG method (charges from electrostatic potentials using a grid-based method; Breneman and Wiberg, 1990) has been used to compute local charges of estradiol-17β-glucuronide. This population analysis has been achieved after full optimization at the B3PW91/6-31G level of theory (B3, Becke, 1993; PW91, Burke et al., 1998; 6-31G, Hariharan and Pople, 1973) using the Gaussian 98 suite of programs (revision A.9; Gaussian Inc., Wallingford, CT). The molecular dynamics simulation (time step of 1 fs) and minimization have been carried out in vacuo. The temperature of the simulation has been controlled by a Nose-Hover chain of thermostats. The cutoff for the computation of nonbonded interactions has been set to 14 Å, and the electrostatic forces have been softened by defining a relative dielectric constant of 2 for the system. Figure 1 shows the HPLC profile of an incubation of estradiol-17β-glucuronide with human liver microsomes, giving evidence for the formation of a more polar metabolite than estradiol-17β-glucuronide. This metabolite was characterized by both its UV absorbance at 280 nm (Fig. 1, top) and by the radioactive trace using the [6,7-3H]estradiol-17β-glucuronide marker (Fig. 1, bottom). This metabolite (XOH-estradiol-17β-glucuronide) was only formed in the presence of an NADPH-generating system, and its amount increased with time. Estradiol-3-glucuronide was not metabolized under such conditions. 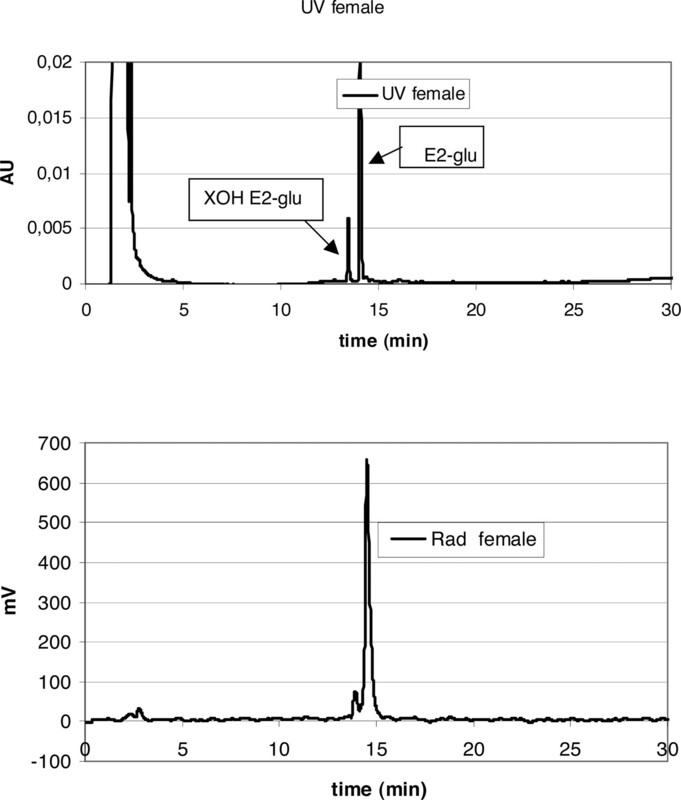 HPLC profile of an incubation of female human hepatic microsomes with estradiol-17β-glucuronide. a, UV trace at 280 nm; b, radiochromatogram. XOH E2-glu, oxidized metabolite of estradiol-17β-glucuronide; E2-glu, estradiol-17β-glucuronide. Among hepatic microsomes from rat, dog, monkey, and mouse, only rat and monkey microsomes yielded detectable amounts of estradiol glucuronide metabolite (Table 1). PB- or DEX-treated rat liver microsomes led to no (PB) or little (DEX) amounts of estradiol glucuronide metabolite. Incubations were performed using 1 μM P450 liver microsomes or 0.5 μM expressed P450 (n = number of independent determinations) and 100 μM substrate for the indicated times in the presence of an NADPH-generating system. The turnover of estradiol glucuronide metabolite formation was about 0.1 nmol · min–1 · nmol–1 P450 using a mixed gender pool of human microsomes, whereas it increased to up to 0.3 nmol · min–1 · nmol–1 P450 using a pool of female human liver microsomes (substrate concentration 100 μM). Time- and concentration-dependent analyses were not linear. As indicated on the product information sheet, CYP 2A6-specific hydroxylase activity was 1.5 times higher in females than in males, whereas CYP 2C8, CYP 2C19, and CYP 3A4 activities were 2.6, 1.8, and 1.5 times higher, respectively, in the female liver microsomal preparations (XenoTech LLC, Tebu-Bio lot 0010143 and lot 0210182, respectively). Upon incubation using human-expressed CYP 2A6, 2C8, 2C9, 2C19, 3A4, and 3A7, only CYP 2C8 and 3A7 were able to oxidize estradiol-17β-glucuronide, CYP 2C8 being 5 times more active than 3A7. The fetal 3A7 isoform has already been implicated in estradiol sulfate oxidation (Ingelman-Sundberg et al., 1975), whereas CYP 2C8 activities differed significantly between female and male liver microsomes. The metabolite formation was linear for about 30 min upon incubation at 28°C with yeast-expressed CYP 2C8, whereas with E. coli-expressed CYP 2C8 at 37°C, it peaked and then stopped after 5 min. Interestingly, the turnover values were high for 5-min incubation: up to 1.2 nmol · min–1 · nmol–1 P450 using Bactosomes and 0.85 nmol · min–1 · nmol–1 P450 with yeast-expressed CYP 2C8; then, the values decreased for longer incubation times. For 5-min incubations using yeast-expressed CYP 2C8, Km and Vmax values were 88 μM and 1.86 nmol · min–1 · nmol P450–1, respectively. Finally, unlike free estradiol, estradiol-3-glucuronide was not metabolized by human or rat liver microsomes. Unconjugated estradiol was only slightly metabolized using CYP 2C8, at least 10 times less than when using CYP 3A4 or CYP 3A7 (data not shown). XOH-Estradiol-17β-glucuronide metabolite formation was only observed using an NADPH-generating system, and 87% inhibition was measured in human liver microsomal incubations performed under a 50:50 O2/CO2 atmosphere (Table 2). Using human liver microsomes, 2 μM miconazole or ketoconazole (CYP 3A inhibitors) was enough to inhibit around 40% of estradiol glucuronide metabolism, whereas 10 μM bromocriptine (CYP 3A substrate), quercetin, or paclitaxel (CYP 2C8 substrates) led to more than 50% inhibition (Table 2). Unlike sulfaphenazole (CYP 2C9), furafylline (CYP 1A2), quinidine (CYP 2D6), and chlorzoxazone (CYP 2E1) inhibitors led to marginal inhibitions usually lower than 25%. The most pronounced inhibitory effect was observed using 10 μM paclitaxel (31% inhibition), whereas 2 μM ketoconazole and 10 μM bromocriptine or quercetin exerted less than 15% inhibition (Table 2). Thirty-minute incubations were performed using the indicated inhibitor concentrations and 1 μM P450 liver microsomes, or 0.5 μM expressed P450 and 50 μM substrate. Data are means of two independent determinations. Metabolite Identification. 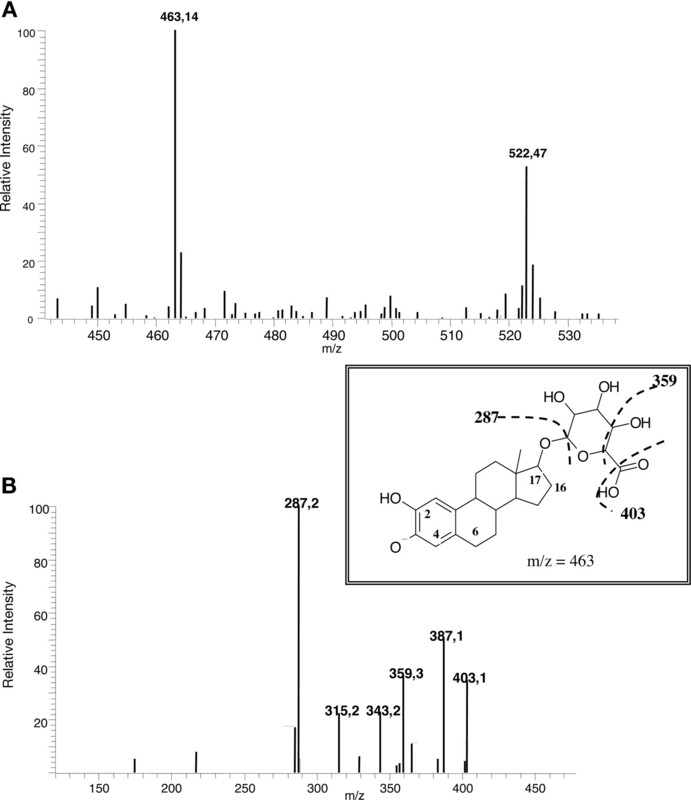 The liquid chromatography-MS mass spectrum in negative ionization mode of the XOH-estradiol-17β-glucuronide metabolite, eluted at 7.3 min under the HPLC conditions, showed a molecular ion at m/z 463 (Fig. 2a), a 16-amu shift in comparison to the parent estradiol-17β-glucuronide at m/z 447, eluted at 7.9 min, which usually means the presence of an additional oxygen atom. The ion of m/z 522 results from adduct with acetate contained in the HPLC solvent. The retention time of XOH-estradiol-17β-glucuronide metabolite was different from that of an authentic estriol-17β-glucuronide eluted at 6.9 min. The MS-MS fragmentation pattern of the XOH-estradiol-17β-glucuronide metabolite led to a predominant fragment at m/z 287, corresponding to an oxidized estradiol metabolite after subsequent loss of an aglycone glucuronic acid of 176 amu (Fig. 2b). This glucuronic acid cleavage was also observed in estradiol-17β-glucuronide fragmentation. Among additional minor fragments at m/z 403 (M – 60) and 359 (M – 104), both were shifted 16 amu from those observed for estradiol-17β-glucuronide at m/z 387 (M – 60) and 343 (M – 104), respectively. These fragments resulted from cleavages of glucuronic acid moiety (Fig. 2, inset). 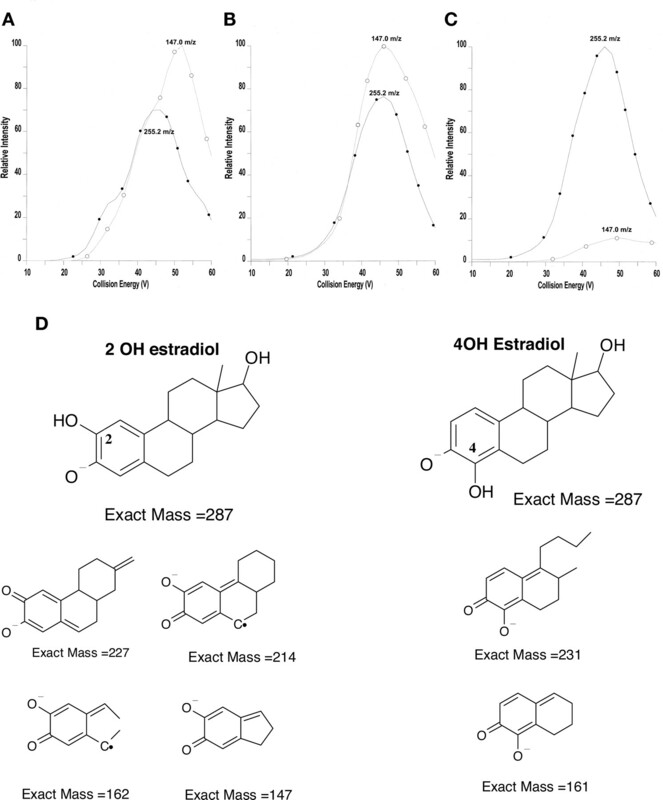 Mass spectra of the hydroxylated metabolite of estradiol-17β-glucuronide. a, mass spectrum in the negative mode. b, collision-induced dissociation of the m/z 463 ion. Inset, structure and postulated cleavages (dashed lines) of the hydroxylated metabolite of estradiol-17β-glucuronide. An attempt to prepare authentic hydroxy-estradiol glucuronides upon in vitro incubation of authentic estriol, 2OH-, 4OH-, 6αOH-, or 6βOH-estradiol with human liver microsomes or baculovirus-expressed-UDPGT2B7 led to the formation of several compounds. The glucuronide function can be potentially located on three different positions: either the given hydroxyl, or the 3-position, or the 17-position. None of these compounds exhibited fragmentation similar to that of the P450-catalyzed XOH-estradiol-17β-glucuronide metabolite. Minor peaks corresponding to the m/z 463 obtained from 2- or 4-hydroxy-estradiol glucuronidation had the same retention time as XOH-estradiol-17β-glucuronide, but only weak fragmentation spectra were obtained, depriving precise identification. Upon further glucuronidase hydrolysis of incubations performed with either human liver microsomes or yeast-expressed CYP 2C8 and estradiol-17β-glucuronide, the deconjugated XOH-estradiol metabolite retention time was around 2.2 min earlier than those of estradiol for both UV and radioactivity detections. The retention time of XOH-estradiol was close to that of 2OH-estradiol, as confirmed by HPLC coelution using modified gradient conditions: 1-h run in the presence of 0.1% acetic acid (Lee et al., 2001). The liquid chromatography-collected hydrolyzed metabolite was directly injected in the mass spectrometer in the presence of 10 mM ammonium acetate, showing a molecular ion at m/z 287. The MS-MS fragmentations were optimized on this sample in negative mode. Fragments at m/z 285 (M-2H), 269 (M-H2O), 255 (M-H2O – CH3), 227, 214, 162, and 147 were obtained (Fig. 3a) and were identical to those of 2OH-estradiol in similar conditions (Fig. 3b). In contrast, 4OH-estradiol collision led to different significant fragments at m/z 231 and 161 (Figs. 3c and 4d), with disappearance of the fragment at m/z 147. Other hydroxylated metabolites of estradiol, 6αOH-estradiol and 6βOH-estradiol, had different fragmentation profiles (data not shown). Identification of XOH-estradiol to 2OH-estradiol was confirmed by a triple quadrupole-induced collision optimization: 2OH-estradiol (Fig. 4b) and XOH-estradiol (Fig. 4a) showed a similar collision energy profile with maximal value around 40 V and a relative product ion 147/255 ratio near 1.3. In contrast, this relative ratio was smaller than 0.1 only with authentic 4OH-estradiol (Fig. 4c). Collision-induced dissociation spectra of the m/z 287 ion mass of the glucuronidase-hydrolyzed metabolite of estradiol-17β-glucuronide (XOH E2). Comparison with 2- and 4-hydroxy-estradiol using an ion trap mass spectrometer. a, collision-induced mass spectrum of the XOH estradiol metabolite (XOH E2); b, collision-induced mass spectrum of an authentic 2-OH-estradiol (2OH E2); c, collision-induced mass spectrum of an authentic 4-OH-estradiol (4OH E2). Optimization of the breakdown curve of the m/z 287 ion of the hydrolyzed metabolite of estradiol-17β-glucuronide (XOH E2). Comparison with 2- and 4-hydroxy-estradiol using a Quantum mass spectrometer. a, breakdown curves m/z 287.2 → m/z 255.2 and m/z 287.2 → m/z 147 of the XOH-estradiol metabolite (XOH E2). b, breakdown curves m/z 287.2 → m/z 255.2 and m/z 287.2 → m/z 147 of an authentic 2-OH-estradiol (2OH E2). c, breakdown curves m/z 287.2 → m/z 255.2 and m/z 287.2 → m/z 147 of an authentic 4-OH-estradiol (4OH E2). The collision energy was continuously modified from 0 to 60 V and the relative intensities of m/z 147 and 255.2 were recorded. d, possible fragments resulting from different cleavage pathways between the 2OH- and 4OH-estradiol. Estradiol-17β-glucuronide Docking Experiments. To gain insight into the substrate interaction with the active site of CYP 2C8, a manual docking of estradiol-17β-glucuronide was performed using the recently published crystal structure (1PQ2; Schoch et al., 2004). The key amino acids suggested to belong to the entrance channel of CYP 2C8, as well as the residues suggested in the pharmacophore description recently published (Melet et al., 2004), were used for the initial location of the substrate. 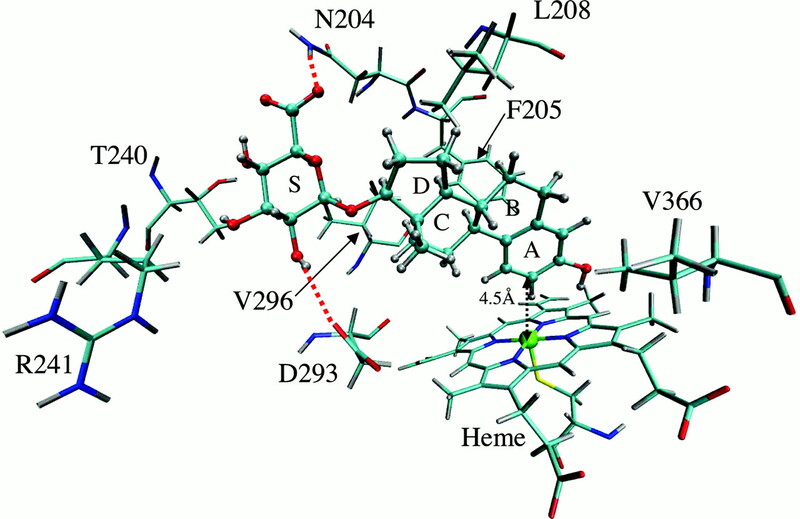 The ligand was initially placed in the entrance channel along the axis defined by the heme-iron atom and by the geometrical center of Cα of four residues chosen as follows: Arg241 from G helix, Phe208 from F helix, Ile102 from B′ helix, and Thr107 from B′-C loop. This initial complex structure was first minimized over 200 cycles. The optimized structure was then used as a starting configuration for free molecular dynamics simulations. Three molecular dynamics runs were performed at various temperatures (100 ps at 100 K, 200 K, and 300 K, respectively). The molecular system was found stable over the whole dynamics trajectories, at each simulation temperature. The three dynamics runs led to a position consistent with the orientation of the substrate corresponding to the oxidation in its 2-position (Fig. 5). This orientation of the glucuronide moiety in the active site is stable in the three dynamics simulations, showing its energetical stability. The sugar orientation is stabilized by two hydrogen bonds: first, between the glucuronide carboxylate group and the amido group of Asn204 (helix F); and, second, the hydroxyl at the C′2 sugar position and the carboxyl group of Asp293 (helix I). This lowest energy configuration of the complex is also consistent with the structural features recently reported (Melet et al., 2004), since key residues suggested to play a role in substrate binding such as Ser100, Ser114, Phe201, and Phe205, are found in close vicinity of the glucuronide moiety in our docking model. In the model displayed Fig. 5, where only residues located at less than 2.5 Å are represented for more clarity, measured distances between ligand atoms and Ser100, Ser114, and Phe201 residues are 4.7, 3.7, and 4.0 Å, respectively. The position of docked estradiol-17β-glucuronide is thus consistent with the observed effects of mutations of these residues (Melet et al., 2004). Three-dimensional representation of the anionic estradiol-17β-glucuronide docked within the active site of CYP 2C8 (letters A, B, C, and D refer to estradiol rings, and S to the sugar moiety). Only residues that are in close contact with the estradiol-17β-glucuronide are shown (ligand-protein distance within 2.5Å). Two hydrogen bonds involving substrate protein interactions are represented by dotted lines. Cytochrome P450 oxidation constitutes one of the first steps of the biotransformation of the hydrophobic compounds. This phase I is generally followed by a phase II conjugation reaction amplifying the hydrophilic character of the given compounds, allowing their elimination from the cells through active transport systems. Such phase I oxidative metabolism, followed by phase II conjugation, is the most frequently admitted excretion pathway of steroids and xenobiotics, and is involved in the control of their concentrations in different organs. Steroidogenesis involves numerous P450-mediated steps leading to a wide variety of hormonally active compounds. These P450s are generally highly specialized P450s able to accept only a small number of substrates. Steroids can also be metabolized in other tissues, mainly located in the liver, by more nonspecific P450s, as, for example, the major human hepatic or intestinal CYP 3A isoforms (Lee et al., 2001, 2003). It has been estimated that over 500 drugs sharing no common structural features with steroids can be recognized and metabolized by CYP 3A (Guengerich, 1995; Lewis, 2001). Closer inspection of the precise catalyzed transformations indicates that for each substrate, there is marked regio- and stereoselectivity. The CYP 3A active site can accommodate relatively rigid substrates such as aflatoxin derivatives or steroids and can oxidize such steroids almost exclusively at a precise position. Thus, CYP 3A4 catalyzes testosterone oxidation exclusively at the 6β-position and CYP 3A7-oxidized DHEA exclusively at the 16α-position (Stevens et al., 2003). Estrone and estradiol are metabolized at the 2-position by CYP 3A4 and CYP 3A5, whereas other P450 isoforms are less active toward these substrates (Lee et al., 2001, 2003). A few years ago, a new P450-mediated oxidative pathway was described for steroid sulfates (Ingelman-Sundberg et al., 1975; Ryan et al., 1984). This was mainly identified in fetal liver due to CYP 3A7. CYP 3A7 specifically metabolizes DHEA 3-sulfate at position 16, whereas testosterone-17-sulfate and estradiol-3-sulfate are metabolized at positions 2 and 15, respectively, by human fetal liver, and estradiol-17-sulfate is not metabolized (Ingelman-Sundberg et al., 1975). 5α-Androstane-3α,17β-diol-3,17-disulfate was metabolized at the 15β-position only (Ryan et al., 1984). To our knowledge, there is only one published result concerning P450-mediated metabolism of glucuronide derivative (diclofenac glucuronide; Kumar et al., 2002). In the present paper, we have demonstrated that estradiol-17β-glucuronide can be oxidized by human liver microsomes to a metabolite identified as 2-hydroxyl-estradiol-17β-glucuronide. This metabolite was characterized by mass spectrometry before and after glucuronidase hydrolysis. This metabolite oxidation is found predominantly in female human liver microsomes, and only the CYP 2C8 isoform is able to catalyze this reaction significantly, with Km around 80 μM and Vmax around 2 nmol · nmol–1 CYP 2C8 min –1. Important variations of activities can be observed between various expressed CYP 2C8 and human liver microsomes, depending on their stability. Such differences between yeast and human microsomes may arise because CYP 2C8 amounts are highly variable and subject to polymorphism in human liver (Romkes et al., 1991; Dai et al., 2001), and because other isoforms can contribute to minor participation in estradiol-17β-glucuronide oxidation, as suggested by the inhibition by paclitaxel (CYP 2C8 inhibitor) and also by bromocriptine, ketoconazole (CYP 3A inhibitors), and quercetin (CYP 2D6 inhibitor) in human liver microsomes. The most abundant human hepatic P450 isoform, CYP 3A4, was unable to oxidize estradiol-17β-glucuronide. The docked ligand position is fully consistent with estradiol-17β-glucuronide carbon 2-oxidation (distance Fe-C2 = 4.5 Å; Fig. 5), whereas the oxidation on the C4 position is much less favored (distance Fe-C4 = 6.6 Å). Another docking is possible, in which the C4 position is pointing toward the iron at a shorter distance to heme-iron (Fe-C4 = 4.8 Å), but in this complex, ligand-protein interactions are less favorable, since the natural curvature of the estradiol moiety fits less the one of the channel. The possible oxidation location of estradiol-17β-glucuronide on carbon position 2 is also in nice agreement with structural requirements suggested by Melet et al. (2004). According to their pharmacophore description for substrate binding in the CYP 2C8 active site, a distance of 12.9 ± 0.8 Å is required between an acidic or polar function and the substrate oxidation location. This finding is remarkably consistent with the distance found between the steroid A ring (C2 and C4 atoms) and the glucuronide carboxylate of estradiol-17β-glucuronide, which is around 13 Å (Fig. 5). This structural determinant is thus compatible with oxidation at the 2- or 4-position in estradiol-17β-glucuronide. In the pharmacophoric model (Melet et al., 2004), there is another site for polar function, which is thought to be located at 8.6 ± 0.6 Å of the oxidation site by CYP 2C8. Indeed, a distance of 9.0 Å is found in the docked glucuronide between the C2 position of ring A and oxygen 17β. The oxidation of estradiol-17β-glucuronide reaction is regioselective since estradiol 3-glucuronide was not oxidized in our conditions. Testosterone-17β-glucuronide is also a substrate of human liver microsomal oxidation, and we are currently investigating the location of the oxidation site. Such oxidation of glucuro-conjugates can also occur with xenobiotics, as demonstrated for diclofenac glucuronide (Kumar et al., 2002) and for naproxen glucuronide (unpublished results). One should note that in these three cases, the oxidation occurs on the aromatic function. Up to now, we have no information concerning the relevance of such a pathway in animals. Recently, Shitara et al. (2004) published data concerning the possible inhibition of CYP 2C8-mediated oxidation of cerivastatin by gemfibrozil glucuronide and the relevance of such inhibitory effects in observed drug interactions (Shitara et al., 2004). We are grateful to G. Bouillé for valuable help during the performance of this study. We thank Drs. M. A. Sari, D. Mansuy, and A. Melet for providing the mutated CYP 2C8 isoform R241A expressed in yeast. ABBREVIATIONS: P450, cytochrome P450; G6P, glucose 6-phosphate; G6PDH, glucose-6-phosphate dehydrogenase; DEX, dexamethasone; PB, phenobarbitone; UDPGT, UDP-glucuronosyltransferase; HPLC, high-performance liquid chromatography; MS, mass spectrometry; MS-MS, tandem mass spectrometry; XOH E2-glu, oxidized metabolite of estradiol-17β-glucuronide; E2-glu, estradiol-17β-glucuronide; XOH E2, oxidized metabolite of estradiol; 2OH E2, 2-hydroxy-estradiol; 4OH E2, 4-hydroxy-estradiol; amu, atomic mass unit(s); DHEA, dehydroepiandrosterone. Aoyama T, Korzekwa K, Nagata K, Gillette J, Gelboin HV, and Gonzalez FJ (1990) Estradiol metabolism by complementary deoxyribonucleic acid-expressed human cytochrome P450s. Endocrinology 126: 3101–3106. Becke AD (1993) Density-functional thermochemistry. 3. The role of exact exchange. J Chem Phys 98: 5648–5652. Breneman CM and Wiberg KB (1990) Determining atom-centered monopoles from molecular electrostatic potentials. The need for high sampling density in formamide conformational analysis. J Comp Chem 11: 361–373. Brooks BR, Bruccoleri RE, Olafson BD, States DJ, Swaminathan S, and Karplus M (1983) CHARMM: a program for macromolecular energy, minimization and dynamics calculations. J Comp Chem A 4: 187–217. Burke K, Perdew JP, and Yang W (1998) Electronic Density Functional Theory: Recent Progress and New Directions (Dobson JF, Vignale G, and Das MP eds) pp 81–127, Plenum, New York. Dai D, Zeldin DC, Blaisdell JA, Chanas B, Coulter SJ, Ghanayem BI, and Goldstein JA (2001) Polymorphisms in human CYP 2C8 decrease metabolism of the anticancer drug paclitaxel and arachidonic acid. Pharmacogenetics 11: 597–607. Goh LB, Spears KJ, Yao D, Ayrton A, Morgan P, Roland Wolf C, and Friedberg T (2002) Endogenous drug transporters in in vitro and in vivo models for the prediction of drug disposition in man. Biochem Pharmacol 64: 1569–1578. Guengerich FP (1995) Human cytochromes P450 enzymes, in Cytochrome P450: Structure, Mechanism and Biochemistry (Ortiz de Montellano PR ed) pp 473–535, Plenum Press, New York. Hariharan PC and Pople JA (1973) The influence of polarization functions on molecular orbital hydrogenation energies. Theor Chim Acta 28: 213–222. Ingelman-Sundberg M, Rane A, and Gustafsson JA (1975) Properties of hydroxylase systems in the human fetal liver active on free and sulfoconjugated steroids. Biochemistry 14: 329–437. Kalé L, Skeel R, Bhandarkar M, Brunner R, Gursoy A, Krawetz N, Phillips J, Shinozaki A, Varadarajan K, and Schulten K (1999) NAMD2: greater scalability for parallel molecular dynamics. J Comput Phys 151: 283–312. Kremers P, Beaune P, Cresteil T, De Grave J, Columelli S, Leroux JP, and Gielen JE (1981) Cytochrome P-450 monooxygenase activities in human and rat liver microsomes. Eur J Biochem 118: 599–608. Kumar S, Samuel K, Subramanian R, Braun MP, Stearns RA, Chiu SH, Evans DC, and Baillie TA (2002) Extrapolation of diclofenac clearance from in vitro microsomal metabolism data: role of acyl glucuronidation and sequential oxidative metabolism of the acyl glucuronide. J Pharmacol Exp Ther 303: 969–978. 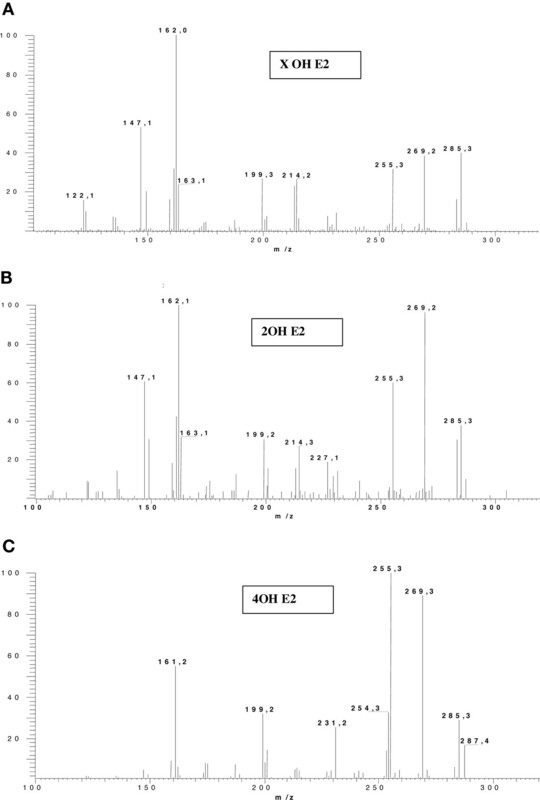 Lee AJ, Kosh JW, Conney AH, and Zhu BT (2001) Characterization of the NADPH-dependent metabolism of 17beta-estradiol to multiple metabolites by human liver microsomes and selectively expressed human cytochrome P450 3A4 and 3A5. J Pharmacol Exp Ther 298: 420–432. Lewis DFV (2001) Guide to Cytochromes P450: Structure and Function, Taylor & Francis Ltd., London. Lowry OH, Rosebrough NJ, Farr AL, and Randall RJ (1951) Protein measurement with the Folin phenol reagent. J Biol Chem 193: 166–175. Melet A, Marques-Soares C, Schoch GA, Macherey A-C, Jaouen M, Dansette PM, Sari M-A, Johnson EF, and Mansuy D (2004) Analysis of human cytochrome P450 2C8 substrate specificity using a substrate pharmacophore and site-directed mutants. Biochemistry 43: 15379–15392. DOI: –15392. DOI: doi:10.1021/bi0489309. Milewich L, MacDonald PC, and Carr BR (1986) Estrogen 16 alpha-hydroxylase activity in human fetal tissues. J Clin Endocrinol Metab 63: 404–406. Omura T and Sato R (1964) The carbon monoxide binding pigment of liver microsomes. I. Evidence for its hemoprotein nature. J Biol Chem 239: 2370–2378. Peyronneau MA, Renaud JP, Truan G, Urban P, Pompon D, and Mansuy D (1992) Optimization of yeast-expressed human liver cytochrome-P450 3A4 catalytic activities by coexpressing NADPH-cytochrome-P450-reductase and cytochrome-b5. Eur J Biochem 207: 109–116. Raftogianis R, Creveling C, Weinshilboum R, and Weisz J (2000) Estrogen metabolism by conjugation. J Natl Cancer Inst Monogr 27: 113–124. Romkes M, Faletto MB, Blaisdell JA, Raucy JL, and Goldstein JA (1991) Cloning and expression of complementary DNAs for multiple members of the human cytochrome P450IIC subfamily. Biochemistry 30: 3247–3255. Schoch GA, Yano JK, Wester MR, Griffin KJ, Stout CD, and Johnson EF (2004) Structure of human microsomal cytochrome P450 2C8. Evidence for a peripheral fatty acid binding site. J Biol Chem 279: 9497–9503. Stevens JC, Hines RN, Gu C, Koukouritaki SB, Manro JR, Tandler PJ, and Zaya MJ (2003) Developmental expression of the major human hepatic CYP3A enzymes. J Pharmacol Exp Ther 307: 573–582. Zelcer N, Reid G, Wielinga P, Kuil A, Van Der Heijden I, Schuetz JD, and Borst P (2003) Steroid and bile acid conjugates are substrates of human multidrug-resistance protein (MRP) 4 (ATP-binding cassette C4). Biochem J 371: 361–367.